Shrouded inside a white bullet-shaped rocket nose cone, NASA's next Mars rover was slowly towed to the launch pad Thursday and hoisted atop its Atlas booster for liftoff to the Red Planet on Nov. 25. The predawn journey across the Kennedy Space Center took a few hours. The convoy moved slowly to avoid damaging the complex Curiosity rover, which is set to begin a $2.5 billion mission to seek evidence whether Mars was once hospitable for life. The spacecraft arrived at the Atlas 5 rocket's Vertical Integration Facility at 4:35 a.m. EDT (0835 GMT), then cranes began lifting the five-meter payload fairing about four hours later. It was in position above the rocket's Centaur upper stage by about 10 a.m. EDT (1400 GMT). Workers planned to make mechanical and electrical connections between the rocket and the payload later Thursday. High winds in Central Florida foiled the Mars Science Laboratory's move to the launch pad Wednesday, but conditions improved and were acceptable for the trip Thursday. David Gruel, the manager in charge of preparing MSL for launch, said the one-day delay going to the pad will mean teams will work Saturday to catch up. That leaves at least one full day of slack to deal with any potential problems between now and launch. Engineers finished assembling components of the MSL spacecraft Oct. 11 inside a decontaminated clean room at KSC. The rover and its rocket-powered landing stage are buttoned up inside an armored atmospheric entry capsule. Since then, crews checked the electrical connectivity of the entire vehicle, mated connectors and prepared wiring harnesses for flight. The team also loaded propellant into the cruise stage, which will guide the spacecraft on the journey from Earth until entry into the Martian atmosphere. The spacecraft was encapsulated Oct. 25 inside the two halves of the Atlas nose cone. The Atlas 5 rocket completed a practice countdown Oct. 13, a standard procedure consisting of fueling and a simulated abort just before launch. 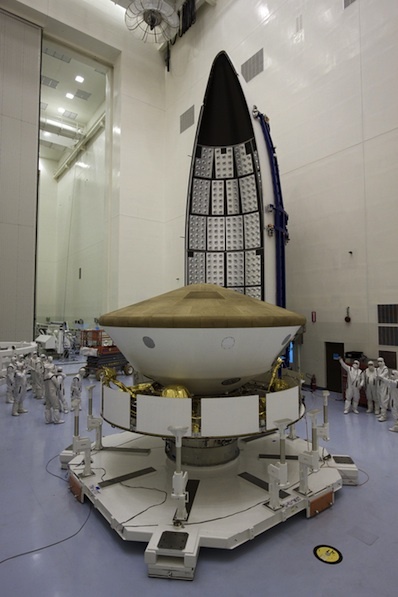 Next up for the Mars probe is a series of tests, connection checks and the installation of nuclear electricity generator. 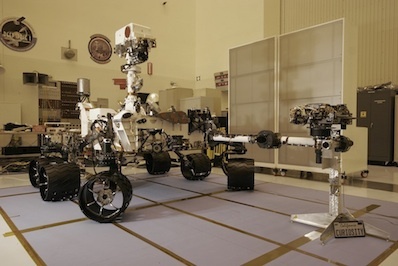 The rover will receive its plutonium power source Nov. 17. Unlike earlier Mars rovers, which were all solar-powered, radioactive plutonium will generate electricity for the Curiosity rover. 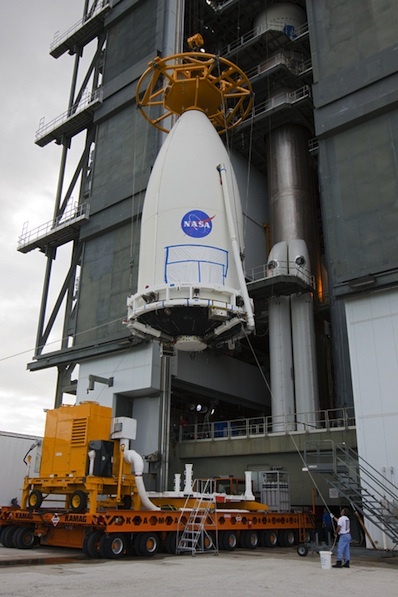 Workers will put in the Multi-Mission Radioisotope Thermoelectric Generator, or MMRTG, through a special access door on the side of the payload fairing on top of the Atlas 5 rocket. The MMRTG is a new design of nuclear power generators for space missions, increasing safety, reducing weight and adding flexibility. Because the MSL mission will utilize plutonium for power, mission designers could pick from a wide range of landing sites and plan for surface operations lasting up to one Martian year, or 687 days on Earth. And unlike solar-powered rovers like the highly successful Spirit and Opportunity, the Curiosity robot can easily survive winters when the sun is low on the horizon. And Curiosity will generate power day and night. Only a fraction of the MMRTG's capacity will go toward powering the spacecraft. The bulk of the energy produced by the MMRTG will be in the form of heat, some of which will be used to warm electronics inside the rover. The rest of the heat will be dissipated through a heat exchanger and cooling loop. The rover's cooling fluid will be loaded on-board right after technicians hook up the MMRTG. After a two-year delay, more than $600 million in cost growth since 2008, and an unplanned funding augmentation earlier this year, the Mars mission is now in sound financial shape, according to NASA. "I don't see any risk associated with dollars getting in the way of launch," Gruel said. The rocket will roll from the integration facility to the launch pad Nov. 23. Launch is scheduled for Nov. 25, the day after Thanksgiving, at 10:25 a.m. EDT (1525 GMT).